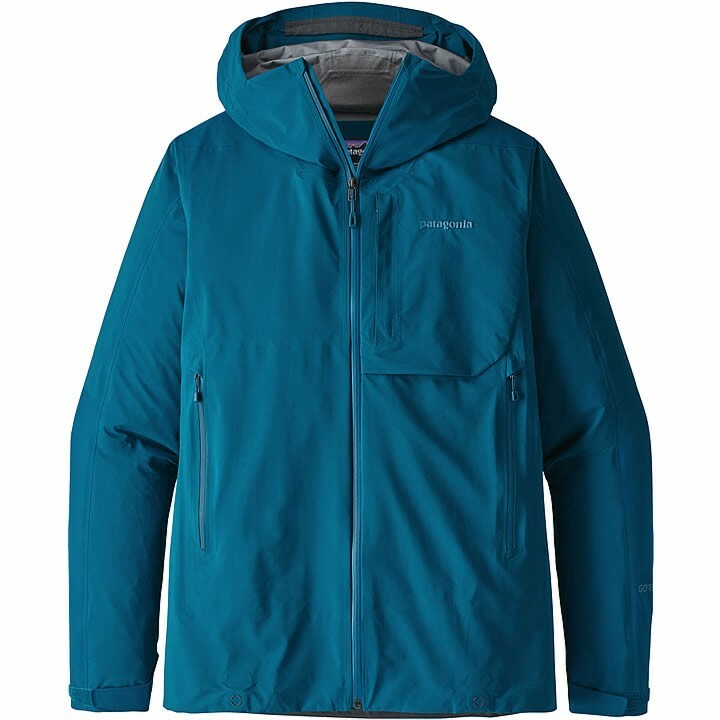 A shelter for the high-country escape artist, Patagonia's Refugitive Jacket uses lightweight and stretchy 3-layer GORE-TEX® fabric with GORE® C-KNIT™ Backer Technology in a fully featured, packable hard shell. Patagonia's lightweight Refugitive Jacket combines full waterproof/breathable protection with stretch for steep climbs and serious descents. The hybrid 3-layer GORE-TEX® construction uses a slightly more robust, stretchy fabric along the upper back, shoulders and the back of the arms for unimpaired mobility. The Optimal Visibility Hood adjusts via an embedded single-pull cord-lock system and fits over ski and climbing helmets alike, while 2-way watertight pit zips let you dump heat on lung-busting ascents. Pockets include two above-harness-line handwarmers with watertight zippers; interior and exterior zippered left-chest pockets; and a right-side interior, stretch catch-all for spare gloves or skins. The hem cinches with embedded cord locks, and an elasticized strap at the lower back connects to any Patagonia® Snow pants (and select Alpine pants) for deep-powder days. With a concealed RECCO® reflector.